Christmas is upon us (far too quickly it seems this year! ), and over the next few days many of us will be cramming in last minute shopping with the kids in tow, and heading off to family and friends for the festive period. We are very lucky to be in the know of some fantastic products, which are specifically designed to make travel with your infant as easy as possible. Whether you’re going by plane, train or car, our baby travel essentials will have you covered. The award winning Baby K’tan Baby Carrier is a wrap-style carrier without the fuss – making travelling with baby hassle free. The ready to wear wrap slips on like a t-shirt, allowing you to comfortably carry infants and toddlers in multiple positions. Available in multiple fabrics and colours, the Baby K’tan Baby Carrier is machine washable, dryer safe, and comes with a matching sash that converts to a carrying bag. We love the Dandelion print! SpaceCot – £139.99 at Hippychick. SpaceCot is the easiest folding travel cot on the market for you and your baby. Designed with space technology and weighing in at just 6kg, it’s light to carry and simple to use. It opens and closes in just 3 seconds – meaning no faffing around when it’s time for baby to rest. We love the silver colour. The only infant bottles on the market that are 100% plastic-free, Pura bottles are designed to stay with your child for life. As your baby grows, the bottle can evolve by simply switching out the silicone top. This also means you can build your bottle for the days activities – choosing from a teat, a straw, a sports lid or more. The bottles are made from durable stainless steel and come in a variety of sizes – perfect for all the family! The limited edition of the award-winning Bibetta Ultrabib will make everyone smile over Christmas dinner. 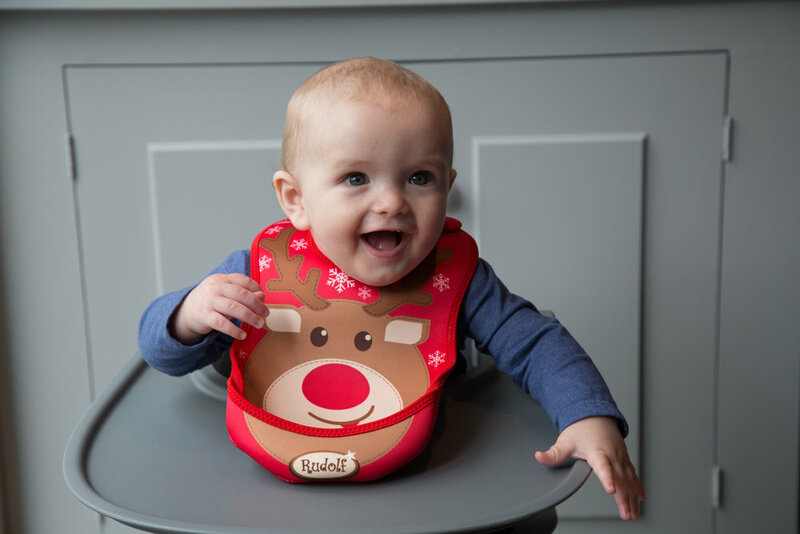 Waterproof, washable and tumble-dry friendly, the adorable reindeer design features the same soft pocket which folds out to catch food - ideal for baby-led weaning and beyond and perfect for catching those stray Brussels sprouts. MamaBabyBliss’ Nappy Cream is enriched with coconut, sunflower and sweet almond oil, beeswax and vitamin E, to soothe and protect your baby’s sensitive skin. Ideal for dry skin conditions such as nappy rash, this all-natural cream will pamper and moisturise your little one. It’s sure to become a changing bag staple! Bibetta’s star-shaped Changing Mats make changing quick and easy. Made from thick, cushioned neoprene, the mats are soft and warm for your little one to lie on and are the perfect shape for them to be able to stretch out. The mats are easily folded down into a compact size – perfect for travelling! Whatever you are doing and wherever you are spending Christmas this year, we hope it is a very happy, healthy and fun-filled one!